Reading this interview with Tim Schafer, I'm taken back to the first R-rated movie I saw with permission. Dad took me and Fletch to see Beverly Hills Cop in 1984. I was 11. It was and it remains one of the great father-son moments. Proof that parents can understand limitations and what their kids are ready for regardless of the law. 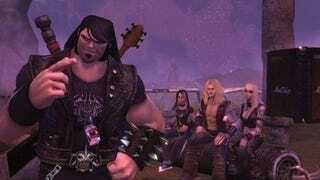 And while Brütal Legend won't exactly be the same thing, Tim Schafer told Planet Xbox 360 that profanity filters will bleep Eddie and others, and a good ol-fashioned PMRC parental advisory label will cover objectionable visiuals, so that kids and dads can also enjoy this badass experience together. Schafer says the inspiration was Psychonauts - "I got a lot of letters after Psychonauts saying 'I really like playing this game with my kids', and so the next thing that we thought about was that people liked to do that." Psychonauts was T. Brütal Legend is, and is necessarily so, an M game. But, just like Beverly Hills Cop, that means dads can pony up for the price of admission to this game, and accompany their kids through the experience if they like. But there's a certain age where - there are certain players who are old enough, but just don't really like playing with all that stuff. So we actually put two things up: there's a profanity filter in the game, where you can actually turn it on and it'll actually bleep all the language out, and it'll actually cover certain profane things with the 'parental advisory' sign, which is in itself is a reference to the PMRC, right, which is part of the history of heavy metal. It's optional, so you can turn it on if you want. There's also a gore filter, which you can turn off, and you won't be dismembered and there won't be blood. It's for those people who like playing with their kids, or who just don't like it. Schafer adds that the filter can be hilarious in its own way, and allows the game to go forward in its own way without being untrue to itself. [With the bleeping, you] can't hear half the words, and your imagination runs away with it. The jokes are funnier. So when you hear "You Beeeeep", in some ways it makes a better joke. So you can turn it on in the game, and it says if you think it's funnier, than you can keep it in the game. And it is actually in some ways funnier. With Jack and Ozzie, you don't want to have them to strain in any way, saying, "freaking", because that doesn't feel right. It feels insincere. Anyone who has seen the Unnecessary Censorship of Sesame Street can attest that Schafer's right. And requiring Ozzie Osbourne to say "freaking" would be ... just ... awful. Sure it's self-censorship, but it's done for the right reasons, and it actually adds value.